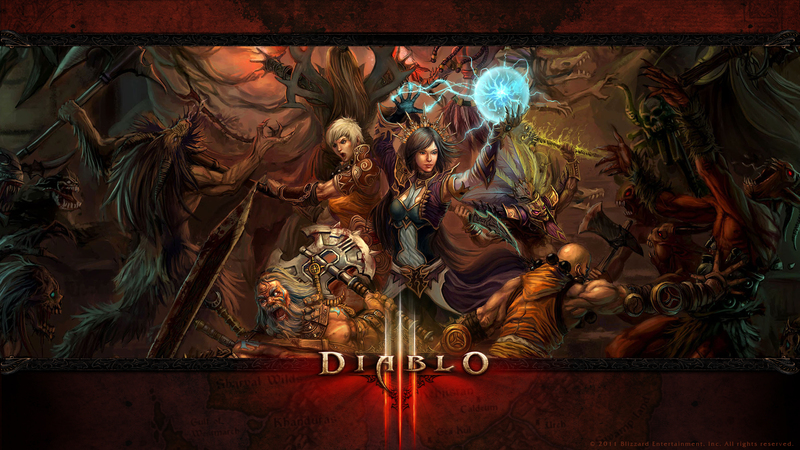 Blizzard recently released version 2.0.1 for Diablo III and with it changed many features about the game in big ways. Many players have returned and a vast majority of those returning players are raving about the patch. The diehard Diablo III players that never left are also raving about the changes brought on by version 2.0.1. This massive overhaul is seemingly in preparation for the upcoming expansion Reaper of Souls as many of the new features and changed features seem to cater to the projected gameplay additions of the expansion. Regardless of why you left the game, you are urged to reinstall Diablo III and bring your characters out of retirement to give Diablo III another round. Here are 7 reasons to reinstall Diablo III right now. That means start installing now and come back to reading this article while it installs. Then share this article with your friends. New Leveling System – Called Paragon, the new leveling system takes you to character level 60 and then further level-ups increase your Paragon level. Paragon levels are indefinite (well technically one could level to 800). Each level adds a point to be spent in one of four tabs: Core, Offense, Defense, and Utility. Each tab has different stats that each point can be spent on. You’ll receive a point for each tab on a rotational basis and a point is locked down to the tab that it was earned for. So for your first paragon level you will earn a point for the Core tab and that point can only be spent on one of the four core stats. Your second paragon level gives you a point for the Offense tab which can only be spent within the Offense tab. So on and so forth. New Loot System – Gone are the frustrating days of receiving a 2-handed staff, an item for a wizard, with a plus strength modifier. Also gone are the days of 50 bajillion white items dropping and clogging up your inventory and screen. That’s right. You will receive less loot but the loot you will receive is more relevant. Items for the Wizard class, for example, will have modifiers that help wizards. There are also a lot less crap drops – white drops are almost a rare to see as legendary drops. New Difficulty System – Normal, Nightmare, Hell and Inferno are no more. The core difficulty system will be one that has the monsters match your level. You’ll also now find a more open difficulty system that lets you choose the level of challenge that you get from the game. If you and your party want a huge challenge, you can crank the difficulty up to “Torment III” on the fly and reap some awesome benefits! Skill trees and runes have been completely reworked – All classes have seen a change in a major way. While all of the original skills still exist, their properties and runes’ properties have changed. Additionally, players are no longer restricted to one skill from each tree – a player could select 6 skills from a single tree to use if desired. You can even set a skill that isn’t from the signature or secondary trees as a mouse click action. Meteor on LMB anyone? Your friends are playing again – (If they aren’t, they need to read this article, too.) The patch brought back hordes of players that had hung up Diablo III. A lot of them are sticking around for the expansion and praising the changes. No more friend lists with all offline friends! Update: Maybe your friends aren’t playing yet but we are. Search for our official in-game community The Lone Gamers. All are welcome! There’s a pretty awesome expansion just around the corner – At least in the Diablo and Starcraft series (I can’t speak for any other Blizzard games), Blizzard has always delivered when it comes to content expansion. Expect some awesome content with Reaper of Souls due out March 25th, 2014. You can even check out some of the upcoming content by checking out your skill trees in Diablo III. Clans and Communities are now official – Now you can officially create a Clan or Community in the game through a new interface. Your members will get an appropriate tag next to their name and there is a new addition to the friends list that displays all online clan members. There are many other changes that can be read in the official Diablo III 2.0.1 Patch Notes.